April Redmond, chief marketer at Kerry Foods, owner of household brands such as Cheestrings, Richmond, Wall's and Mattessons, explains why the business wants to embrace a disruptive marketing mindset. Children have a special advisory role at Kerry Foods HQ. The food business has been running consultations with kids for the last 18 months on everything from packaging design to NPD for its Cheestring brand. Children, quite literally, have an influence on the future direction of the business. Which makes sense, given two of its major brands, Cheestrings and Yollies, are marketed as a lunchtime snack. "We've set up a board of what we call mini Cheestring MD's and we basically workshop with them and say: what would you like to see from the Cheestrings brand? Every time we do something we go and sit with them and talk to them about what we're doing and get their insights," explains Kerry Foods CMO April Redmond. "Kids are changing all the time and with the best will in the world, a bunch of people sitting in leafy Surrey aren't going to be switched on to what they want. In effect they run our business and run our brand." The intent of the business is to be the "most disruptive, innovative" company in chilled foods. "At a high level, innovation has been a focus of what we do... To compete in today's marketplace you have to think like a challenger." 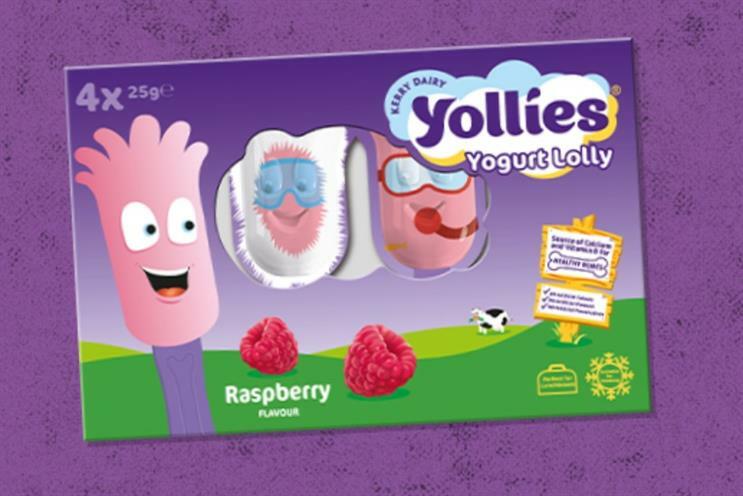 She cites Cheestrings as a brand that has been a focus of NPD, with the launch of Yollies - a solid yoghurt on a stick. "We've developed a world first, which took quite a lot of time and energy to get a yoghurt to stay on a stick, as you can imagine - and figure a way to market it." "We've stretched the brand equity into a new category. We weren't prepared to go in as a 'me too'... and weren't prepared to go head to head [with Frubes]." The brand was launched last summer with a TV ad and "is doing really well", she claims, adding how children are captured by the characters, packaging and the "playability" of the product's collectable sticks. The brand has a "Marmite effect" for those with a pre-existing expectation of what yoghurt should taste like, but is a "big bet" for Kerry Foods that taps into mums' desire for healthier sweet treats in the lunchbox. On the savoury side of snacks, Kerry Foods wants to make Fridge Raiders to gaming what popcorn is to movies. "We started off on this theme of being disruptive with how we think of things with a YouTube gaming celebrity. We asked him and his community what is the number one thing you dislike? And they said 'your fingers getting greasy when you game'." The brand made a 'meat snacking helmet' for "fun", working with his community and R&D lab to design it. Taking that idea further, they connected with gamer Ali-A to create a robot called FRHANK that was programmed by the gamers' community. "This is quite different marketing for a foods company. We obviously do some TV but the bulk of what we do on Mattessons is digitally-led and community-led in the world of gaming. We're making massive inroads and our association with gaming is very high." The focus for Mattessons is indicative of Redmond's increase of the digital budget by 30%. When she joined from Coke in 2010 the marketing mix was "really horrendous", she says. "When I joined we were spending maybe less than 5% on digital. This year coming it will be upwards of 35% on digital, which is what I would consider FMCG-leading. "A lot of our spend is migrating," she says, adding that on Mattessons the brand gets a return on digital that outstrips TV. "I could imagine in another three years it will be more like 50% [allocated to digital]. Younger consumers are spending very little time consuming TV in a traditional way."